After all the Thanksgiving feasting and left over creations, you might be craving something light and healthy by now. This salad, inspired by Philadelphia’s famous Israeli restaurant Zahav, a personal favorite, is a modern take on tabbouleh. It would be great on its own or with some added shredded left-over turkey or chicken or as a side to grilled fish. Full of fall flavors and crunch, it introduces a surprise burst of flavor from quick pickled onions seasoned with the Middle Eastern spice, ground sumac. Don’t have sumac, just add a squeeze more of lemon juice. 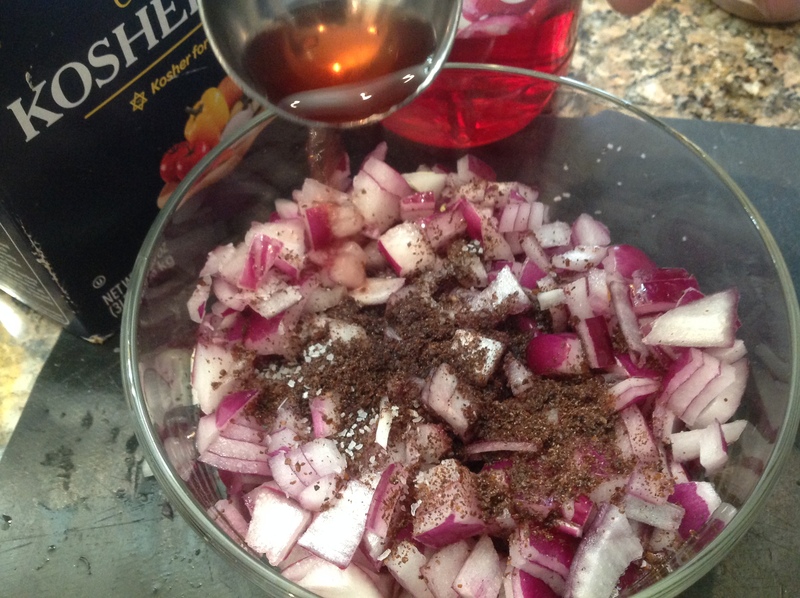 1-For the sumac-pickled onions: Combine red onion, wine vinegar, sumac and 1/4 teaspoon kosher salt in a small dish and set aside while you prepare the other ingredients, at least 15 minutes, overnight if preparing ahead of time. 2-Combine all the salad ingredients and toss with the pickled red onions, in a medium bowl with the vinaigrette. Taste and adjust ingredients as desired, more lemon, more honey, more heat-however you like. This salad can be prepped ahead without the vinaigrette and the walnuts, so they don’t go soft. Just before serving toss with the dressing and top with the walnuts. Easy pickled red onions spiced with sumac bring a surprising flavor twist to the salad. Look at those gorgeous colors and all the crunchy texture! 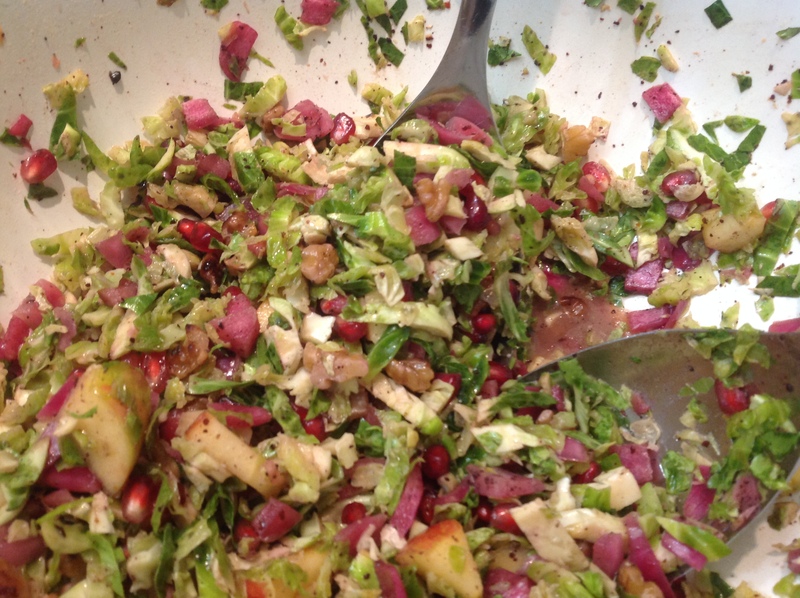 This entry was posted in Recipes and tagged brussel sprout salad, pomegranate, shredded brussel sprouts, sumac by Johanne Lamarche. Bookmark the permalink. What a beautiful salad! I’ll be pinning this one to try over the holidays! After all those guilty treats you’ve been cooking up Julie, you will need a salad or to ride your bike all the way to Philly so you can try Zahav’s in person! You got that exactly right Johanne! 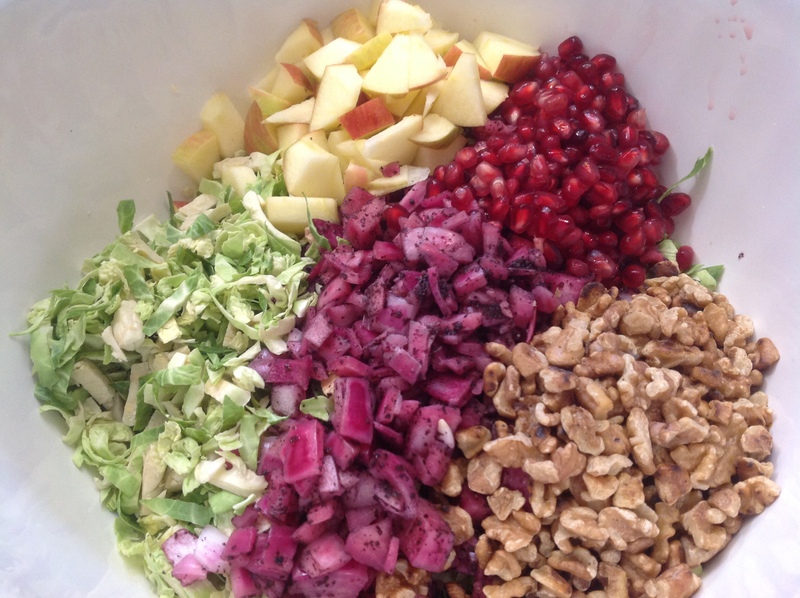 This looks awesome…the funny thing is that I am making roasted brussel sprouts, pomegranate and walnut salad as well 🙂 I need to try out the onion pickles soon. Your salad sounds good Zeba! I went a whole lifetime without eating brussel sprouts and now I can’t get enough of them! LOL! 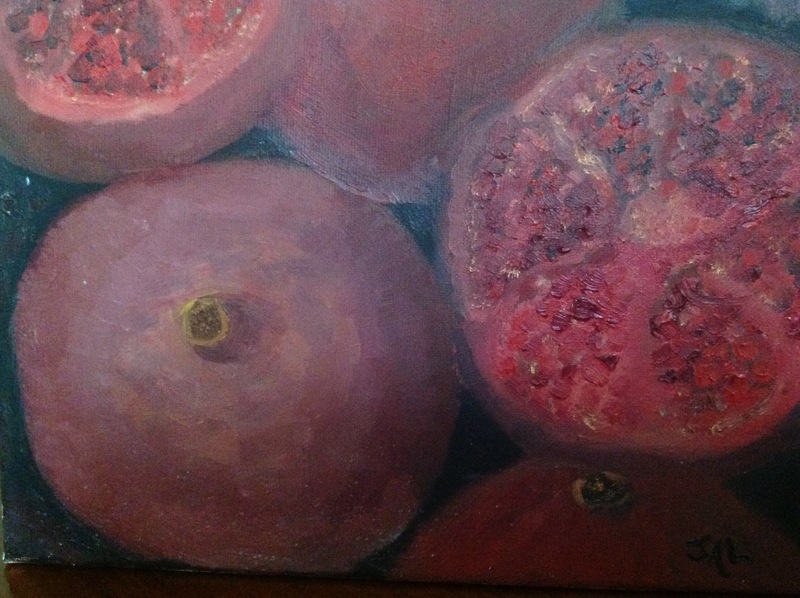 This looks so beautiful, Johanne. I have all the ingredients except the brussel sprouts. Need to get some soon so I can try this out! thank you for the recipe! Hope you enjoy the salad as much as we did Indu! Oh, you know I will be pinning and making this one! Lovely!! Hope you love it as much as we did Mollie!